In Colorado, we are fortunate to see a lot of sunlight during the winter and summer months. Unfortunately, many of us have suffered the miserable effects of too much sun while we’re hiking, biking, shopping, skiing or just simply enjoying the sunshine outdoors. It’s too easy to get a sunburn while you’re in Colorado—we get caught up in our activities and have a tendency to forget to re-apply (or apply) sunscreen while we make the most of our activities. You already know how to prevent a sunburn and the potential risk of skin cancer that sunburns cause, it’s okay—nobody is perfect. Everyone has likely experienced a sunburn at some point in their lives, which is the inspiration of today’s article. Kallgren Dermatology clinic in Boulder wants you to have an enjoyable summer, safely soaking up the sun. However, if you lose track of time and wind up with a lobster-red sunburn at the end of the day, you can still relieve yourself of the pain and treat the sunburn. Prepare for the summer’s sun and learn how you can treat the discomforting symptoms of a sunburn. One of the most of effective ways to treat a sunburn requires you to act fast. At the first sight of overexposure, cool off the surface of your skin by taking a quick dip in the water if you’re at a pool or the lake. Then apply more sunscreen and cover up to protect your skin from further damage. Continue to cool the burn with a cold compress and follow with a brief, cool shower. Long showers can dry out the skin and irritate the sunburn more. While your skin is still damp post-shower, apply a gentle and moisturizing lotion to the sunburn. Avoid lotions that are petroleum or oil-based as those ingredients can trap the heat from the sunburn and worsen over the next couple of days. Continue to apply lotion on a regular basis so it won’t dry out. Sunburns swell, which is usually the source of the discomfort. 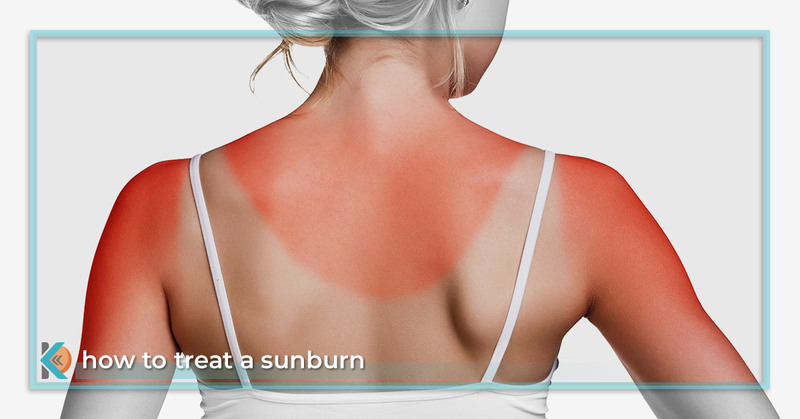 At the first sign of a sunburn, take an anti-inflammatory (NSAID) such as ibuprofen or aspirin. This will help with any swelling, pain, and discomfort. Depending on the severity of the burn, some doctors will suggest applying an over-the-counter cortisone cream to help calm the redness. Aloe vera is another common topical solution that will soothe and cool the irritation. It’s important to replenish your fluids and stay hydrated when you have a sunburn. Burns draw fluid to the surface of the skin away from other areas of the body. It is possible to become dehydrated as the result of a sunburn. Continue drinking plenty of water to replenish your electrolytes until the skin heals. If the sunburn results in severe blistering over a large portion of the body, like your back or legs, you should seek medical attention as soon as you can. Or if you develop a fever, get the chills, and feel lightheaded or confused, then you should consult with your doctor right away. Avoid scratching off or popping blisters as that can lead to infection. Taking a vitamin E supplement or applying a few drops of vitamin E oil directly on the skin can also help with inflammation. Once the sunburn has calmed down, coconut oil can be applied as a natural skin moisturizer. Prevention is the best sunburn remedy. Stay in the shade and avoid direct sunlight when possible. If you are planning a day outdoors, be sure to apply a sunscreen with a minimum of SPF 30 and continue to apply it to exposed skin every couple of hours. The Boulder dermatologists at Kallgren Dermatology Clinic are passionate about the health of your skin. Overexposure to the sun can lead to premature aging, melanoma, and other types of skin cancer. Our Boulder Dermatology clinic carries the best skin care products to treat and protect your skin from the harsh elements of the sun. We want you and your family to enjoy this summer as best as you can. However, you must plan ahead and keep yourself protected. Don’t let a sunburn put a damper on your summer plans! Visit Kallgren Dermatology to pick up your skin products and make an appointment with the Boulder dermatologists!